-Grills up to 3 extra large burgers. -Unique patented contact design, grills evenly. -Thermostat controlled ready light, indicates when grill is ready. -Non-stick coated cooking plate, for easy clean up. -Patented channels, carry run-off grease and fat into separate tray. -Special drip tray to catch run-off fat. -Specially designed spatula, that fits perfectly into the grooves of the grill plates. 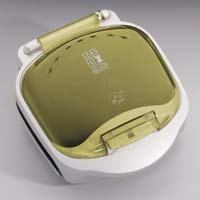 -Topped by a colorful bun warmer with a transparent, bright YELLOW lid. Its appeal lies in its simplicity and countertop convenience--not to mention its fat-fighting ability! The double-sided grill, has over 50 Square inches of non-stick cooking surface to cook burgers, steaks, chicken breasts, sausage, fish, shrimp, or vegetables in minutes. (FREE Special recipes, accompany the grill). The popular grill marks not only look appetizing, but also contribute caramelized flavor. Patented Sloped design allows the deep channels to collect fat, into a safe plastic tray stationed under the units front. The grill also has a floating hinge, to accommodate foods of varying thickness. SEE more of the famous George Foreman Grills on this page. The George Foreman family of fine fat reducing grilling machines, represents a major portion of the indoor / outdoor cooking market. They come in portable electric and portable propane styles. You can use these bar-b-que grills to braise, brown, broil, boil, blanch, or reduce foods. Or you can sizzle a thick juicy steak, cook burgers, chops, hot dogs, spare ribs, vegetables, and many other delectable foods. Many families today are very health conscious, and of course want to live longer healthier lives. Therefore millions of them opt to purchase one of these barbeques to do the majority of their bbq grilling. The days of messy charcoal-broil grilling are almost over, thanks to these inexpensive and easy to use tools. Mr George Foreman has been a truly great boxing champion on several occasions throughout his long and delightfully entertaining career. As a matter of fact according to published reports, George Foreman is now considering coming out of retirement to box again. Big George has already began his working out schedule, and has lost weight by training and exercising. The barbecue products that George Foreman endorses, like his famous George Foreman Lean Mean Fat Reducing Barbeque Grilling Machines and other grills and recipe cookbooks, are champions in their own right. They are champions in the home, kitchen, and back yards of millions of people. These master grilling tools, are also favorites of tailgate party goers everywhere. Especially the deluxe oversized yet portable Wheel It And grill It Suitcase and other propane gas fired versions of Big George's best selling grills. The extra large grilling surfaces of his Wheel It And Grill It BBQ Grills as well as other George Foreman Grills, are also excellent to take to the beach, camping, fishing, and hunting. Now you can buy direct, so don't miss out on these sales and everyone of our other catalog items that are the best buys online. Whether you are on an Adkins Atkins type low carb diet to lose fat weight, these can help you and your family live longer healthier lives, by cutting out alot of the fat content presently contained in your foods. Learn more about ou r line of George Foreman Grill by clicking on this link: George Foreman Grills. Here at AAWSALES.com, every one of our items are always discounted and on sale. And to show our appreciation, we also have VALUABLE FREE THANK YOU GIFT PACKAGE offers for our customers!